If you'd like to inquire about noise associated with a particular airport, or express your concerns about noise, most airports have noise analysts that respond to airport noise issues, or you can ask for the airport manager. You can click the link below to access a select list of airport and related noise links. This list is extensive, but does not include all noise links. You can also check the Internet for your local airport's website, or the local telephone directory for airport telephone numbers. You can also contact your local FAA Airports District Office (ADO) for assistance. Click here to find your local FAA ADO office. 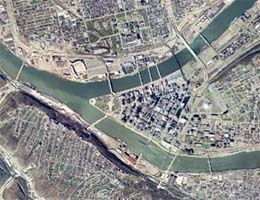 Photo Credit: Pennsylvania DCNR PAMAP Program Aerial Photograph of Pittsburgh, Pennsylvania.